Cleveland Rocks. And Contains No Arsenic. Fiji water, the schmancy bottled water that sells for like $9, is getting heat from Cleveland. 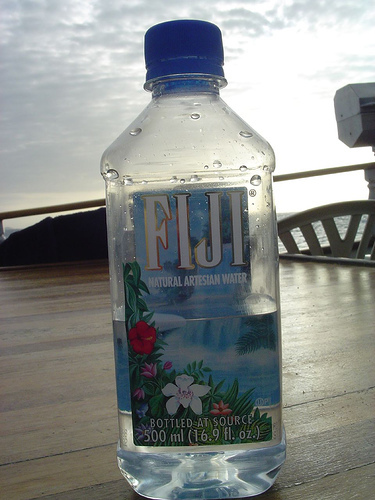 A recent ad campaign for the bottled water says: ""The label says Fiji because it's not bottled in Cleveland." It's running in national magazines, such as Esquire. That angered Clevelanders, including public utilities director Julius Ciaccia, who decided to test the bottled water. What did he find? Arsenic! Well, okay, a little arsenic: 6.31 micrograms of per liter. Cleveland's city water, Ciaccia points out, has none. "Before you take a cheap shot at somebody, know what you're talking about," said Cleveland water commissioner J. Christopher Nielson. True, true. Fiji should stick to what it knows: it's breathtakingly beautiful beaches, which anyone would have to admit are better than Cleveland's. Photo via Flickr, from A&S .